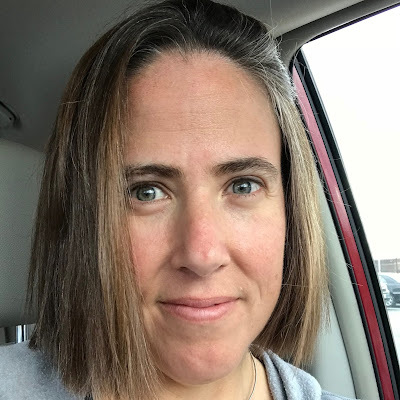 There are certain perks that come with this blogging gig, one of which is getting invited to events like blogger day at the Shrek the Halls ICE exhibit at the Gaylord National, which is in Maryland or DC or maybe just across a harbor from Virginia, but regardless is somewhere near me. Team Stimey at Team Shrek! We were lucky enough to go last year and had a really fun time, so when we got an invitation again this year, we jumped at the chance. 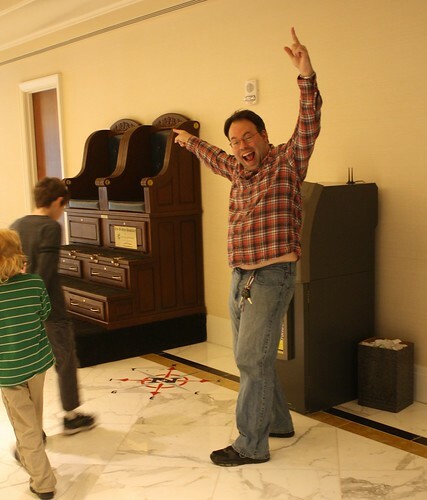 I would like to thank the Gaylord National for hosting us (and disclose that we didn’t have to pay for any of the activities you’ll read about) so graciously. I had a really fun time, but more importantly, my kids had a really fun time, so thank you! I’ve decided to show you how fun ICE! is by posting a pictorial time line of our afternoon there. It will show you both the joys and sorrows and also the potential sensory nightmare that you might walk into. Don’t worry, you’ll know it when you see it. I apologize that some of the photos are blurry. One of my kids rubbed their fingers all over the lens to remove the condensation from it. It is not the fault of the Gaylord or their decidedly non-fuzzy reality. We started at a cupcake reception, which was lovely. You won’t get that if you go to ICE! Sorry. You have to be part of a MEDIA EVENT for that. 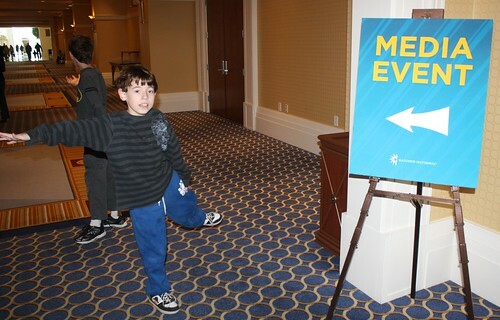 Jack was the only one of my children willing to attempt to make an “event” next to the sign. Thank you, faithful Jack. The Gaylord has events (at extra charge, see bottom) that go along with ICE! to make it a full-day experience, which is great. 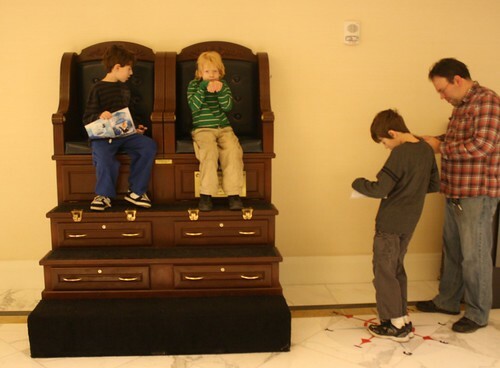 One of those is the scavenger hunt in which kids figure out clues to find things throughout the hotel. My guys, Sam especially, remembered the scavenger hunt from last year and was totally stoked to go at it again. I don’t know if the hotel decided that last year’s scavenger hunt was too easy or what, but they upped their game this year and made the hunt decidedly more difficult. Thinking…thinking…by Shrek, I think I’ve got it! We figured that we’d be able to finish the hunt in the half hour or so before our ICE! tickets, but that was not to be. We went down an escalator and found a clue. Then we went down some stairs and across a room and found another clue. Then we went up some stairs and found another clue, at which time I took a photograph of my family figuring out said clue, when…PHOTOBOMB! I know that I say this a lot, but I might really mean it this time: This could well be my favorite photo in the history of time. After that clue, however, things fell apart a little bit. We went up and down and up two floors then back down, then we thought we figured it out, but then it turned out we didn’t, but then, ALEX FOUND IT! This, ladies and gentlemen, is what a hero looks like. Then Sam and Alex figured out the clue while Quinn made his “cute” face and then we got reprimanded by an employee for playing on the shoe shine stand. No, not really. I just said, “Yes, sir,” and dragged the munchkins out of the chairs. From there, we walked over to the ICE! tent and got ready for the main event. They show you a little movie before you go in, which this year was all about the construction of the ice sculptures. They bring people over from China to build the exhibit. How cool is that? I mean, in a non-literal sense. 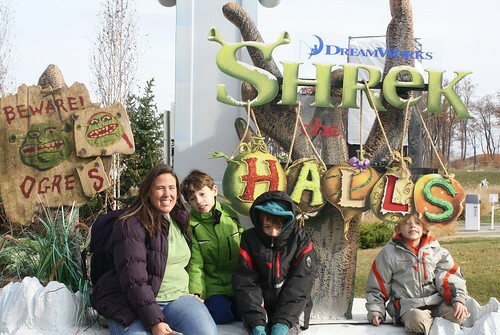 This year’s exhibit is based on Shrek the Halls and was very fun. My kids were looking forward to the ice slide, which they remembered from last year. What I remembered, however, was how cold it is in there (9 degrees), so I’d brought coats, hats, gloves, and scarves. 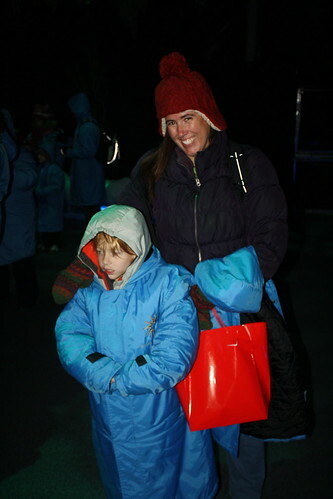 Plus the staff gives every visitor a big blue parka to wear. This, incidentally, is where it all went to hell. I’m going to give you a tip: If you have a child with sensory issues, maybe consider getting him an adult coat instead of a kids’ coat, because the kids’ coat on top of his own coat may just be too intense. Quinn started SCREAMING. SCREAMING. This was particularly awesome because they line you up right after you put on coats and take a photo in hopes that you will buy it later. They couldn’t find our photo when we came out, which is a shame, because oh lord, I bet it was a doozy. I might have bought it just as proof of how horrified Quinn was. I was trying to help him adjust his coat and make it better and he just kept screaming, “IT’S TOO STRAIGHT! IT’S TOO STRAIGHT!” And Alex and Sam and Jack kept walking forward and I didn’t want to lose them because it is IMPOSSIBLE to find people once you’re inside because it is dark and everyone is dressed exactly the same, but people were staring and Quinn continued to shriek, “IT’S TOO STRAIGHT! IT’S TOO STRAIGHT! Oh, we were a scene and a half. Finally I managed to get the rest of my family to stop and I realized that what Quinn meant was that with his coat and the blue coat, he couldn’t bend his arms—they were too straight. So I did what you have to do when you’re the mom: I traded coats with him. And all was right with the world. If a little cold. Add this to the list of reasons why you’re glad you’re not married to me. 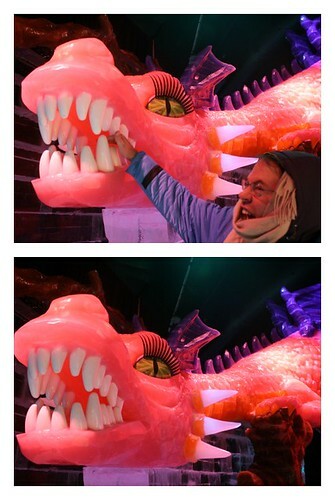 Both photos are pretty cool, actually. Anywho, we enjoyed the rest of the exhibit and then headed back over to the Gaylord to make a gingerbread (actually, sugar cookie, but who really cares) Christmas tree. This was my kids’ favorite part of the day, I think. 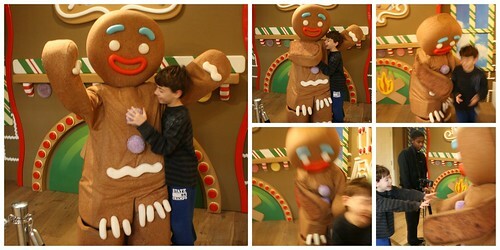 But better yet, Jack found his new best friend—Gingy. 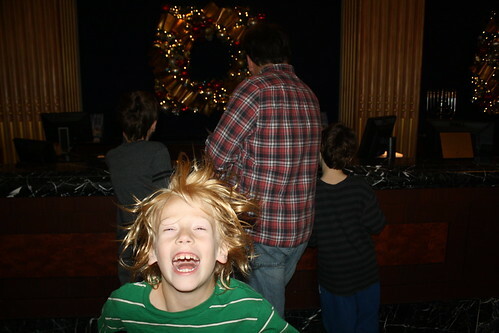 See, Jack had run into Gingy, the giant gingerbread man, at some point earlier in the day and had pretended to try to take one of his gumdrop buttons and Gingy had reacted in an extremely excellent way and Jack was just waiting to do it again. Sorry about the blur, but it all happened really fast. Not creepy at all, Gingy. Not creepy at all. 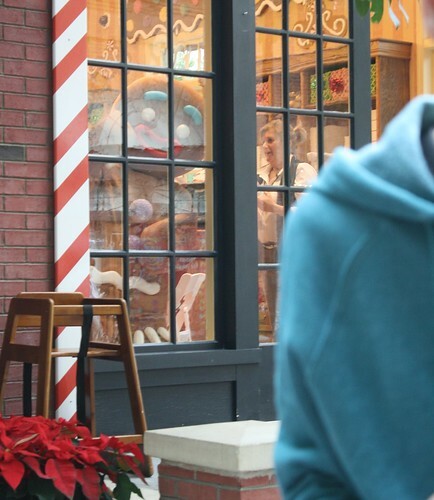 Here’s the thing: Jack was just one kid wandering around the Gaylord that day. What that dude inside Gingy did to make him feel special and to laugh? That is the kind of thing that will make me go back to the Gaylord National and decorate gingerbread every single year, blogger event or not. Gingy made the day for me. Thank you, Gingy. May your gumdrops remain stuck to your chest. After that, it was a matter of heading back to the ICE! tent for the character meet and greet, which is always fun. As you might expect, Jack loves these. Quinn even went up to all of the characters, which is a first for him, I think. After that, we finished the scavenger hunt and claimed our prize. 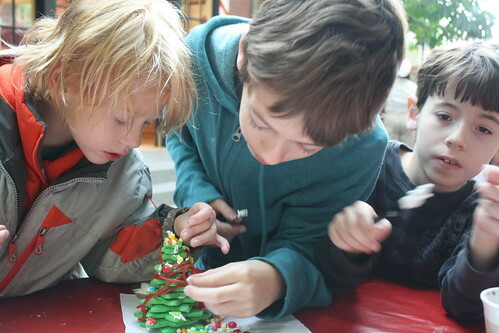 We were going to wait for the free nightly tree lighting and indoor snow fall, but by this time my sensorily sensitive children were done. 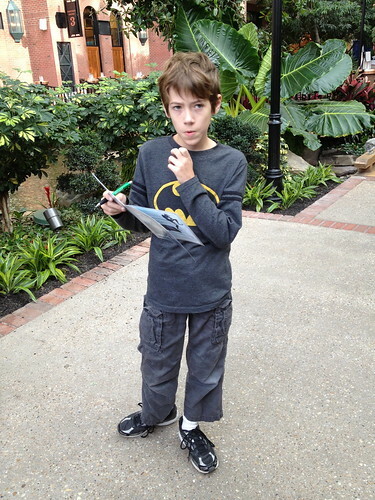 Quinn was standing in the middle of the atrium shouting, “I want to go home! I want to go home!” and Sam was sulking because he evidently didn’t get ALL the credit for the scavenger hunt. We hung out by the fountain for a minute and then left for home. The fountain calmed them down considerably. ICE! 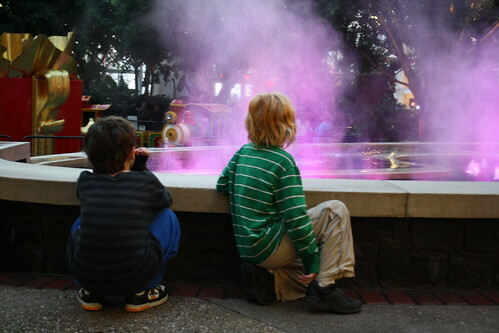 at the Gaylord National runs through January 6. 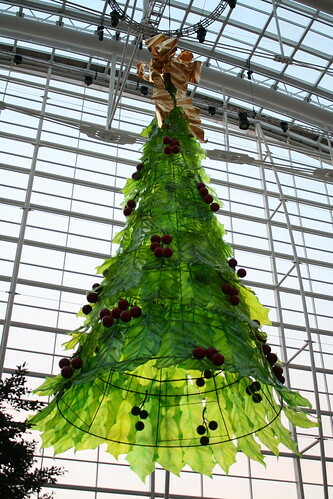 You can find all the information and prices on the website at http://www.gaylordhotels.com/gaylord-national/christmas-on-the-potomac/ice-experience/index.html. You can go just to do ICE! or you can add the scavenger hunt and character meet and greet. The gingerbread decorating is separate as well. The tree lighting is free nightly. There is also a Santa there that you can have your photo taken with. 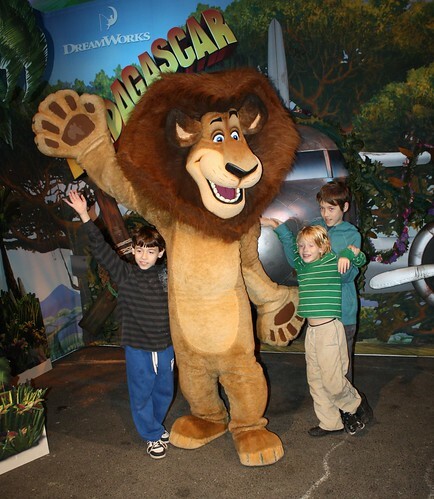 I know that, despite a couple of hiccups, my kids had a wonderful time and really enjoyed going. Thank you so much to the Gaylord National for treating us to such a lovely afternoon. Team Stimey truly appreciates it. Thank you, ICE! 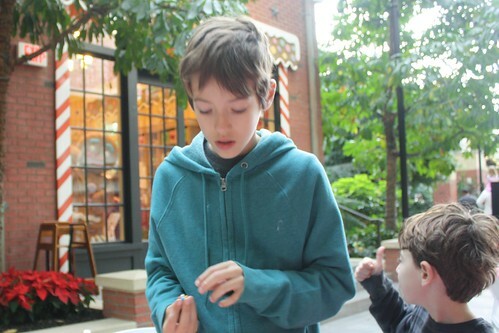 at Gaylord National! Look Out, New York! It’s Team Stimey!